I haven't done a tutorial since my 55 step Print Gocco Tutorial in 2008. I think it's time for some new ones! I fell in love with watercolor around 2001, when I started using them instead of markers to separate my presentation renderings from conceptual ones for interior design projects in college. I also worked at a wonderful independently owned art store, Pygmalion's Art Supply in Bloomington, Indiana, where I got to learn so much and enable others to buy art supplies daily. 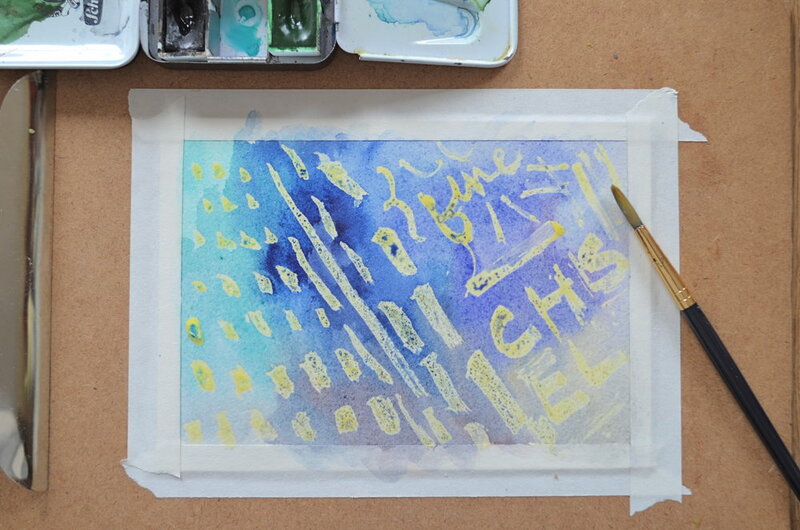 Today we're going to focus on Masking Fluid, and how you can use it for your paintings. There are tons of details, and hopefully you can learn from some of my trials and errors over the years. 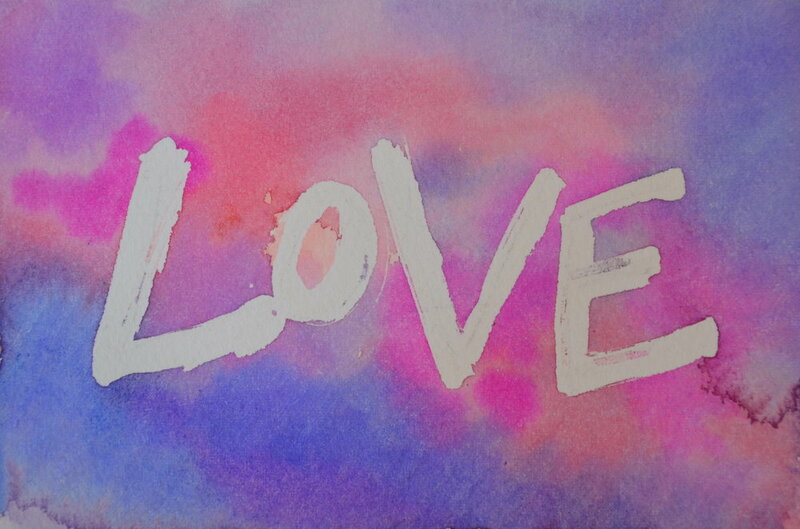 What is Masking Fluid? Why is it Useful? Really, you just need the fluid, something to apply it, paper, and water. Bonus items have an asterisk. 1. Masking Fluid: I use Winsor & Newton Art Masking Fluid or Pebeo Drawing Gum. 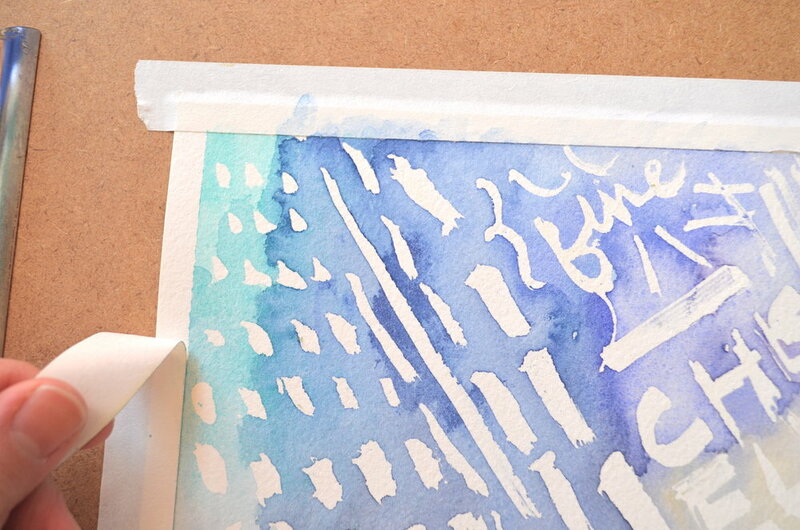 For tiny, intricate details, you may prefer a masking fluid pen*. 2. Watercolor Paper: I am partial to Arches 140 lb paper in cold press, but any paper will do. 3. Watercolors: Whatever you have will do, pans or tubes. I used my Schmincke Horadam Aquarelle (artist grade) set here. 4. Something to Apply the Masking Fluid: I recommend a cheap synthetic brush that you don't mind ruining, or will assign just for this purpose. Some directions say you can wash off the masking fluid, but it's a latex based solution and can sometimes be hard to get off. Just to be safe, I use a 99 cent type brush that is pretty small. You can also use Q-tips, toothpicks or anything else. I do love my Grafix Incredible Nib* that is specifically made for this purpose, has a pointed tip and a chisel edge. 5. Artist Tape*: I use Artist Tape to create a border around my work (which is the same principle as the masking fluid by the way). 6. Rubber Cement Eraser*: These rubber cement erasers are handy and last forever. 7. Water: I recommend high quality H20. Just kidding, I couldn't resist quoting The Waterboy. 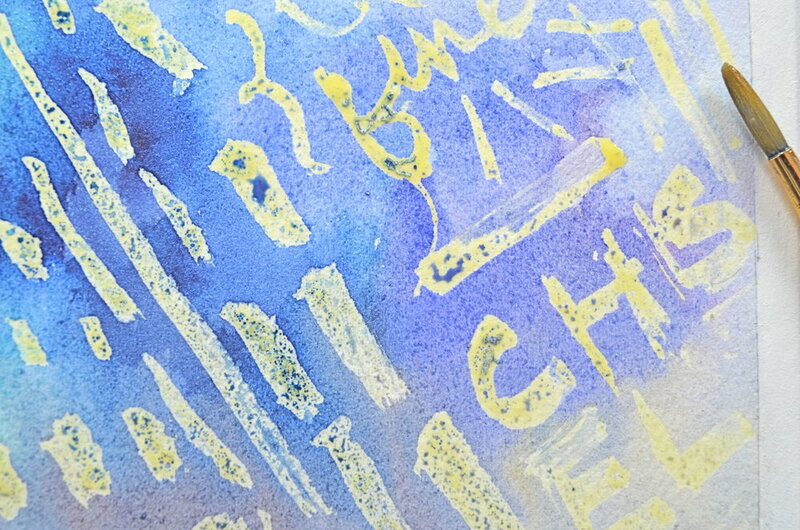 Masking fluid should only be applied on dry paper. If not, it will not work correctly. If you mess up an area, don't wipe it up. Let the masking fluid dry completely and peel it up. The fluid needs to dry thoroughly or it will not work. Plus it can stain the paper if you smear it when it's not dry. 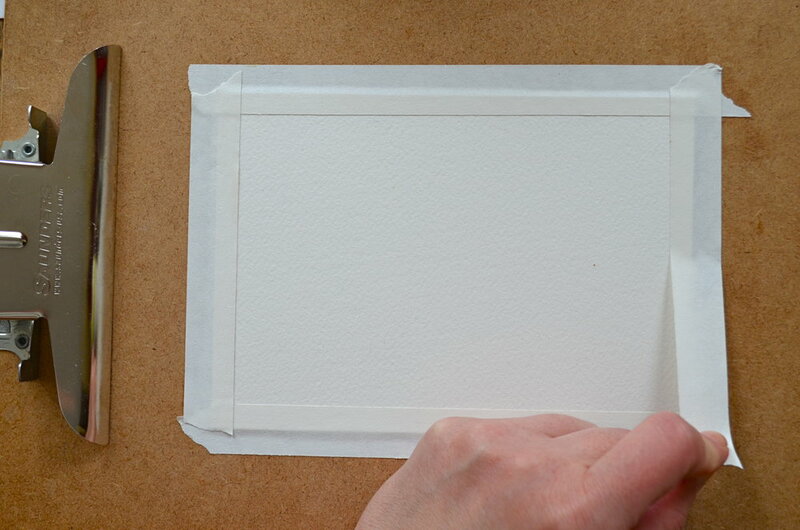 Remove the masking fluid at your earliest convenience, but don't worry too much. Depending upon my schedule, I usually leave it on for about 20 minutes, or up to a week with no trouble. I only encountered it once, but masking fluid can stain your paper. I recommend doing a test first, especially if you have an important project or deadline. I think hot press (smooth) paper can be less forgiving, and some masking fluids are better than others. Alternatively, I found an interior design project from 2001 which still had masking fluid on it. I removed it 14 years later with no issues. If you don't have a rubber eraser, just pick at the dried masking fluid and it will come off. You can use what you peel off to get the rest off easier. Let me know if you have any questions or have your own advice to share in the comments. Tag me on Instagram @marissahuber if you make something using these new skills. I'd love to see what you create!